Why Not Settle it in Smash?! Most recently, there has been a lot of talk and discussion about the presence of electronic sports, or playing games for money. I have been acquainted with many people and parents that have been wondering how it is possible, and if this actually exists for all sakes and purposes. For what it's worth, anything that could have money or fame involved could very well have a sport. For video games, we have always had competitive games, and for that matter, we can take it further to see who is the best of the best and settle it in any manner deemed necessary. For myself, I find that the most notable examples would lie in the games that I play: League of Legends, and Super Smash Bros..
A character is only as good as the player in many cases, however in the Smash Bros games, there are specific characters that can be deemed best overall. Perhaps for recovery, or maybe damage output, these characters seem to excel in being great based on the numbers within the game, and can be played to the fullest extent that the professional players play with. 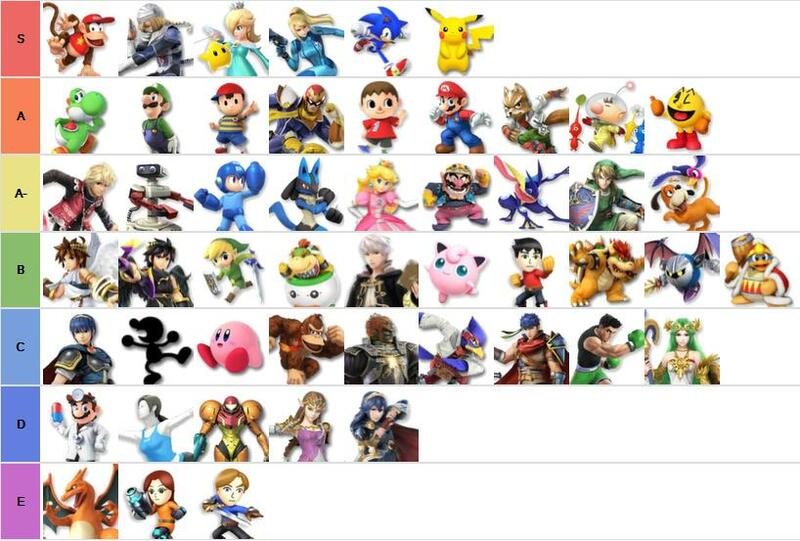 For Smash in particular, there are quite a few characters that are considered good, just to be considered good, based off of their attacks, recovery, movement, and tech. In the hands of a competent player, these characters only get stronger and can have even stronger of an impact to say the least. I for one play Pikachu, Yoshi, and Luigi competitively. I have played these characters since Brawl, Melee, and Project M, and this time around, they are rather top tier characters. They each have quite a bit of versatility, and with this iteration of the game, they essentially got supercharged in regards to the attacks they can use, the tech that I can work with, and the punishes becoming very real. According to the list, under many cases, I should win if I am playing against another character that is lower on the spectrum. But this is not the whole determining factor. A character can still only be as good as its player. Someone who is not too skilled in Diddy Kong could still lose to someone playing the Mii Swordsman. Skill is still a heavy asset in this game, and it always has. Each player has a different play style, and those that are higher on the spectrum are there because in the hands of someone who is knowledgeable of the game, they are very powerful. What I'm getting at with this whole post, is that the tiers are not the determining factor in regards to playing video games. There are many characters that are good just to be good, but in the hands of a competent player, the good characters can be deemed the best. In the Smash Community, there is a lot of controversy about what goes into the tiers, but it's a simple matter really. They take the roles of the professional players, and who they play, and base it off of that. Some characters get higher based on numbers, others based on style of play. But in the end, each character can be played extensively well, and it should act as the true determining factor. For all of you, I would recommend playing these games to play the characters with a style you enjoy. I enjoy fast based fighting with lots of versatility depending on the situations, so with my mains, it works out perfectly. But play who you want, and don't pay too much heed to the tier listing. From there, you will surely improve your game, and you can settle it in Smash at your local tournament, or with your friends! It's also worth noting that our Smash Bros Club is hosting a tournament this upcoming Tuesday, so wish me luck cause I'm gonna take home the win!